I am thrilled to have Heather here with this heart-opening post. My friend Heather King has been writing at The Extraordinary Ordinary since 2007. She’s an editor for Story Bleed Magazine, a contributing writer at A Deeper Family and Owning Pink, and one of the directors of Listen To Your Mother Twin Cities. She is a sporadic tweeter at @HeatheroftheEO and her blog has a facebook page for you to follow. Heather lives in Minnesota with her family, including one husband, three children, a dog and three chickens. I met Heather at the Serenity Suite at Blogher 12. The Serenity Suite, an alcohol free zone which was created by Heather and her friends as an island of calm in the bustling conference, was where I had the best conversations in the entire event. Whenever I began to feel overwhelmed, I headed up there, the Serenity Suite helped me feel nourished and grounded. I will be forever grateful for the friendships I started there. Before I pass the mic on to Heather, I’d like to invite you to join us for the Mama’s Comfort Camp Twitter Party on Sunday March 1o at 8:30pm eastern. We will be talking about judgement free motherhood and celebrating a year of our safe haven for moms from around the world. Please join the conversation by using the hashtag #mamascomfort. And if you are a mother of kids of any age, please join us, and whether you are a mother or not, we’d love it if you could “like” and share our facebook page which is the gateway to joining the group. My sweet and salty Elsie is already hell bent on making me look 50, rather than 38. The nurse who helped catch her almost two years ago said that she had never once in all of her years as an OB nurse been kicked like that. So hard. So fiercely. She hasn’t stopped kicking, my girl. Or hitting or biting or pulling hair and she has definitely not stopped screaming. This girl can even get mad at me in her sleep. Really. If I go in to kiss her goodnight as she sleeps, and I happen to move the blanket just a bit or move her body just so, she squeaks an angry garbled retort and swings at me in the dark. She doesn’t know what she’s doing, this is just how she is. I’m exhausted by her within moments of the day’s beginning, each day. The days are long and hard and I’m not just saying this: They are long and hard and I wouldn’t trade them for anything. Nothing. But, I’ll admit, I’m a happier person, a happier mother, the two days a week when Elsie goes to daycare. I have space in my day and my mind, and I look forward to our reconnection at the end of the day. I miss her when she’s not home, and I need to be away from her because it’s the only way to avoid the burnout, the inability to feel like doing anything at all. I like it that she goes to daycare, and I’m not going to feel guilty about that. I could not have said that after baby number one and baby number two, Elsie’s big(ger) brothers. It may have been true back then as well, but I couldn’t face it. It seemed to obviously mean that I am a terrible mother. Mothers that are not terrible don’t mind being home with their kids. They don’t get so overwhelmed. They don’t get so sick of being together all the time and they probably love playing kid games and doing crafts. I’ve struggled through my share of PPD and anxiety and I’m in recovery from alcoholism. These are the seemingly broken parts of me that are keeping me grounded, rather than shaming me, as they once did. I can no longer afford to compare myself to the other perfect mother that isn’t even real, whatever she chooses to do with her time. My drinking probably had more to do with my inability to be honest with myself than anything else. I got up day after day with a baby boy and a toddler boy and my husband traveled for work and wine was the carrot at the end of the stick, the end of the day. Here’s your gift, it said. You did it. Of course, that can be okay and true for some women, but not we alcoholics. It just took more and more and more wine and then it was an addiction and I had to get help. That was three years ago, and as the days pass, I am finally able to see myself and my behavior clearly. This is good because once I let go I learned that accepting how I feel, whether it seems like a good feeling or not, is key to freedom. Today Elsie Jane raised the bar. She’s teething or something. She’s mad. At daycare she doesn’t hit or have tantrums. At home, she does. I’m sure people look at me and wonder what I’m doing wrong. Only I can know that we’re consistent parents. That Elsie is going to be Elsie no matter what. That I’m her good mother, who she takes her frustrations out on every day. She finds most anything frustrating, and yet she is the most endearing little chipmunk cheeked girl you could ever know. She puts her head on my chest and sighs. She pats my back when I get hurt. When I was away for two days with her daddy, she was so excited to see me upon my return that she nearly exploded. On the mornings that daddy or I take her to daycare, she’s happy. She gets to see some other people her size and she likes it. She thinks she’s twenty anyway. I kiss her goodbye and I feel relieved. This does not make me a horrible mother. My love for Elsie never changes, I’m simply a human being who needs time away in order to remain more patient than I would otherwise be. I’m someone who is prone to anxiety. When days pass, one after the other with no time away, my anxiety builds to a level that isn’t healthy for anyone, including me and my children and my husband. Mostly them. I’m faster to anger and I’m not at all engaged. Things bother me that normally wouldn’t and I can’t seem to keep myself from reacting rather than responding. At these times, I’m still not a horrible mother, but I am not the mother I want to be. Even with time away, there are of course still times when I am anxious and exhausted and failing in my perfectionistic eyes. But even then, I’m requiring myself to be kinder to me, to accept that I’m only human, I have three kids and a dog and three chickens, a house and a van. Our middle son has a medical condition that keeps me on my toes and my oldest son is navigating the school years while I learn to let go. My husband still travels for work and I don’t drink. So, I surrender. To this day as it is. A fierce teething Elsie kind of day. I revel in nap time and I try hard to focus on her beauty that’s all over her insides and her outsides. I laugh with her brothers and try to ignore that I can’t get anything done. I repeat to me, Stay here now. Stay here now. This is all I can do. I cannot always behave like some kind of quiet and calm person that I am not, but I can be the best me by accepting us all, it all, as is. This takes practice, but let me tell you….you will not stop feeling that shame and guilt over not being enough in your own mind unless you try it. And keep trying, because Mama, you are just fine. You are more than fine. You are exactly all that your kids want. They just want YOU. That’s all. YOU. Being away from you sometimes in order to come back to a lighter version of you is okay, too. Please don’t forget that. Today, I took a deep breath, standing in the kitchen, trying not to cry. I had just handed Elsie her lunch and she immediately took it and threw it down, noodles and sauce flying every which way. I still had on my pajamas and my hair was greasy. We’re getting ready to move. Daddy is out of town for work. I’m stressed. There have been recent doctor’s appointments to learn new things about my oldest boy. I have work to do as one of the directors of Listen To Your Mother Twin Cities. All day, Elsie has been crying or screaming, leaving messes in her wake like it’s her job. Right after she threw her food, her five year old brother, Asher, asked if I wanted to play Spiderman Memory with him. Over Elsie’s screams he shouted over and over again, MOMMY, LET’S PLAY THIS!!! MOMMY! MOMMMMYYYYY! Before, I would have said no, fast and out of habit, because I can’t breathe and she threw her food and UGH. But I said yes, out of nowhere, just like that. I left the dog to licking up the mess and Elsie screamed from her high chair and I sat down with Asher and smiled at him. He beamed. Sometimes you just have to do one small thing differently and it changes the day. You know what we say, right? This too shall pass. OH and it does, so quickly. One day, I might even get some of my groove back. For now, we’re in this particular stage in this particular time and I’d have it no other way. I’d even have me no other way, even on my worst days. My kids have never wanted a perfect robot for a mother anyway, which is good, since they have this messy human one. They go to daycare tomorrow. I need to miss them, and I will. I cryed when I read this, the good kind of tears. 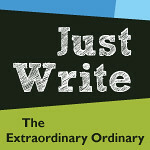 Heather is the mama behind the Just Write linkup series, which elicits some of the best writing in the blogsphere. Heather, this was what I needed to hear today. I too struggle with anxiety. When I am just going and going with no break, that is when the anger explodes. My family just wants me. I’m adopting “Stay here now” as my new mantra. Thank you for your beautiful words. Oh Heather I got me one of those too. She has challenged me from the get go and yes we she started school full time I was doing little happy dances in my heart. Love never changes for them you just need a break once in awhile! !Thank you for sharing to let us mama’s know we are not alone. Leonard Cohen talks about the broken places as the spots where the Light manages to make its way in. I like that idea. It allows me to cultivate friendliness toward my brokenness. Big love to you, my Dear.